Today I'm sharing my summer patio which I refreshed and redecorated just a little bit since last year. The biggest change out here was recovering the cushions on my furniture with this black and white striped fabric from Amazon. The cushions have springs on the inside and are flat on the bottom, so I was able to recover them easily with a staple gun, scissors, and no sewing. I shared a little more about my porch clean-up process and everything that I added/ changed here. Like many areas of my home, most of the items out here are not new, and most are thrifted or second-hand. I think it makes even more sense in an outdoor area to be a little more thrifty and creative with furniture and decor since it may easily get damaged or wet quicker. I was lucky to get my wicker patio furniture for free as it was my grandmother's and is still in amazing shape. Other than that, all of my furniture was thrifted or collected from garage sales, while most of my accessories/decor pieces are newer from Homegoods, At Home, or Target. I love to mix and match the older and newer pieces and I think it makes the space feel extra cozy! 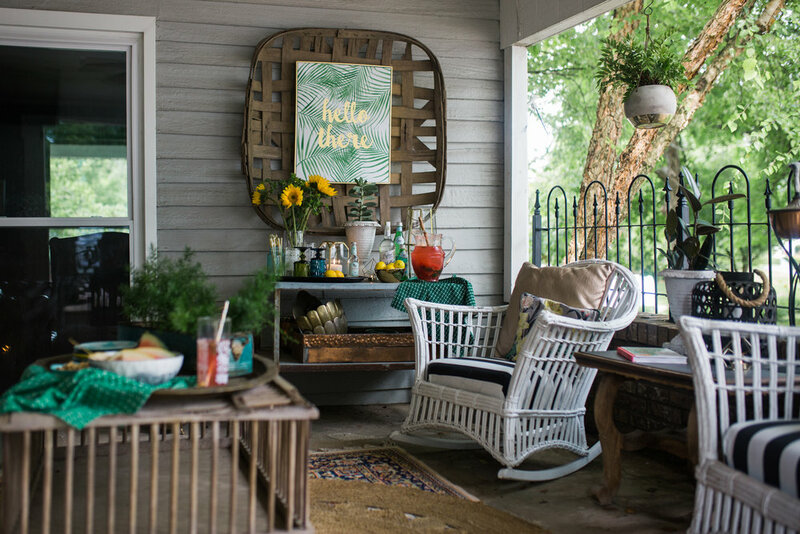 I've linked tons of similar decor pieces for you to shop below, but if you have any questions about anything else on my porch- just ask!